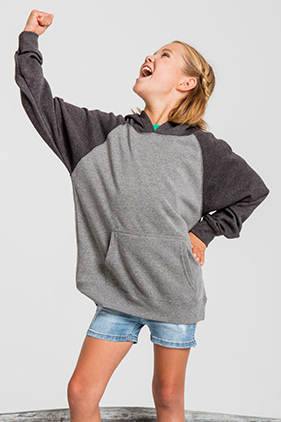 One touch and you will be hooked on Special Blend fleece! 52% cotton/48% polyester 6.5 ounce lightweight hood with 30 single polyester/cotton blend facing. This new special blend fabric features unmatched softness. Raglan sleeves. Unlined hood. No drawcord. Reverse cover stitch sewing. 1x1 ribbing at cuffs and waistband. Front pouch pocket.